Red Eye, also known as Red Eye w/ Greg Gutfeld from 2007 to 2015 and Red Eye w/ Tom Shillue from 2015 to 2017, is an American late-night/early-morning satirical talk show on Fox News, which aired at 3:00 a.m. ET Tuesday through Saturday, 11:00 p.m. Saturday, and 2:00 a.m. Sunday. The show features panelists and guests discussing the latest news in politics, pop culture, entertainment, business, sports, and religion. The show was created and originally hosted by Greg Gutfeld, a self-described libertarian. Gutfeld hosted the show from February 2007 to March 2015, and was replaced by comedian Tom Shillue on June 22, 2015. On April 3, 2017, Fox News announced that Red Eye had been cancelled. The show's final episode aired on April 7. 5.3 Park51: located at the crossroads of "Sensibility" & "Sensitivity"
Andrew Levy discovered Gutfeld's writings on the Huffington Post and began leaving comments on Gutfeld's posts. As Levy's comments grew to include responses to other commenters, Levy "half-thought" the more outrageous comments were by Gutfeld himself. After discovering a post on Levy's blog on this theory, Gutfeld e-mailed Levy he did not write them, which began a correspondence between them. Gutfeld would eventually notify Levy about upcoming posts or ask him to look at his writing. Levy was also asked to join Gutfeld's new blog "The Daily Gut." Later Levy was asked by Gutfeld to join him in a new Fox News program. Bill Schulz was an assistant editor at Stuff Magazine when Gutfeld was hired as Editor in Chief. Toronto Sun columnist Rachel Marsden was added later. Gutfeld remarked, "I think they just thought she would be a good kind of lightning rod." Red Eye was originally named Wasteland in its early testing stages. At one time, a series of video clips of this early version were available on the Fox News website. The original name, Wasteland, was selected because the show was about "a land of waste" and meaninglessness. The show was later renamed Red Eye because the original name was thought to be too negative and would repel viewers. The phrase "Red Eye" was chosen because the term was likely to resonate with viewers because it somehow captured the essence of the program. John Moody, Executive Vice President of News Editorial for Fox News, stated, "We want a word... that evokes what the show is." Shelly Stevenson, senior producer at Fox News said, "we wanted to come up with something that tipped its hat to the people we are serving." According to Moody, one of the producers, among the original target audiences were "slackers and losers," the "depressed, the dissatisfied, the depraved," "bloggers, and those "age 18–40"
Following the first weeks of the program, the Chicago Tribune filed suit against News Corporation, the company that owns Fox News Channel, alleging that the show's title could be confused with the Tribune's free commuter daily, RedEye, launched in 2002. Senior Vice President of Fox News John Moody proposed to U.S. District Judge Elaine Bucklo that Red Eye be blacked out from Chicago area viewers to prevent confusion with the Tribune's RedEye. In the event Fox News lost the case, Moody proposed cancelling Red Eye and reinstating reruns of Fox Report w/ Shepard Smith. On April 4, Judge Bucklo denied the Tribune Co. injunction request. Bucklo stated that while the trademarks may be similar aurally, but not visually, Fox did not show intent to "pass off" Red Eye as a collaboration with the Tribune. Bucklo also noted a dissimilarity in content which "appear[ed] to include anything that strikes Gutfeld's interest." Discussion "rarely appear to last longer than a minute" and the format was "intended to be outrageous and funny." Bucklo also writes, "Animals and sexual topics dominate the discussions." Bucklo stated that "the only similarities between the products are the fact that both involve a media used to deliver news." On May 30, 2007, regular Red Eye panelist Rachel Marsden was removed from the show and escorted out of the Red Eye offices by security guards, which Marsden alleged is standard procedure when a Fox employee is fired. On her blog, Marsden, said, "I will no longer be appearing on the show, as I have been told that it is heading in a 'different direction' from its inception and I am the 'first casualty'. As a political and news commentator, being a panelist on what had become a totally off-the-wall-and-into-orbit show was an interesting experience. It was also the first time that I was ever considered the 'sane one' on any program, so I am grateful for that unique opportunity and wish the boys the very best of luck.'" Her last appearance on the show was on May 30, 2007, after talking through the laughter of a Jeffrey Ross punchline. Former permanent panelist Bill Schulz's final appearance on Red Eye was on November 7, 2013; his departure (for undisclosed reasons) was officially announced on November 22. In 2016, Schulz confirmed that he was fired from the show but didn't disclose any details. On March 29, 2011, the first episode of the Red Eye podcast debuted. Usually, a new podcast episode was available every day. Most installments featured Gutfeld, Levy, and Schulz. In the event of an absence, Tom O'Connor, a Red Eye producer, filled in. Usual topics of discussion include what the cast does in the course of the day or weekend, news events, preparation for the show, and guests on that day's show. The podcast is currently offered in the YouTube video and MP3 audio format. With the start of The Five, the podcast was eventually discontinued, ending on August 22, 2011. A modified version which would become titled "Not LIVE! w/Lauren and Bill" debuted on April 4, 2012. Schulz and O'Connor were joined by Red Eye regular Lauren Sivan who appeared remotely from Los Angeles, California. After the departure of Schulz from Red Eye, the podcast was discontinued. The podcast ceased on October 17, 2013. The podcast resumed on April 12, 2016, taking a slightly different format. It usually features three or four cast members from the show, but they typically discuss more random comedic personal topics and rarely cover news or current events. The audio quality routinely suffers from excess noise generated by buttons worn by the co-hosts. On February 4, 2014, Miss New York USA 2013 Joanne Nosuchinsky was announced as the new permanent panelist (ostensibly to replace Schulz). She had been a frequent guest on the show since her first appearance on September 18, 2013. On the Red Eye w/ Tom Shillue broadcast at 12 a.m. on August 5, 2016, Nosuchinsky stated that after two and half years at Fox News, she would be leaving the network. On the August 6, 2016 broadcast of Red Eye, her last, Nosuchinsky stated that she was leaving Fox News to pursue an acting career. On his last show on February 28, 2015, Greg Gutfeld announced that he was leaving Red Eye after eight years to host a new weekend program for Fox News. While the show aired at 3 a.m. ET, it was actually taped at around 8 p.m. ET the previous night. Gutfeld once joked, "We wouldn't be able to survive after three months because we'd all become raging alcoholics if we had to stay up until 3 a.m.!" The show features a round table of panelists, as well as guests linked by satellite. Tom Shillue, with advisory from Andy Levy, writes the daily content. The show begins with Shillue's introduction of his guests, which include flattering, exaggerated comparisons about each of them. These guest introductions are sometimes submitted by fans on Twitter. Other non-traditional characteristics of the show include the use of offbeat imagery, often obscure viral videos featuring animals, especially cats, during certain segments. Andy Levy, referred to as "TV's Andy Levy" or "TV's Very Own Andy Levy", acts as the show's ombudsman, appearing in the "Halftime Report w/ Andy Levy." A "A Block, the Lede, that's the first story." E One or more of the following: E Block, last story, that's the last story. A The Most Important Story of the Day. Oxymoronically, this is often a "weird news" item that is featured primarily for its comedic value. B A Moment with Tom. Shillue's main monologue, followed by discussion. C Halftime Report with TV's Andy Levy. In his capacity as the show's ombudsman, Levy offers additional jokes and engagement with the evening's panel. D Another story or a THFTP segment. E Tom's Bedtime Story. Shillue attempts (humorously) to relate a final news item to his childhood experiences. "Pinch", a caricature of the liberal elite media named after Times publisher Arthur "Pinch" Sulzberger, was a puppet made from a folded New York Times newspaper and was intended to represent The New York Times itself, not simply a single correspondent or columnist. The puppet was voiced by series-regular Bill Schulz, who also operated the mouth movements by pulling a string atop the puppet. Pinch had appeared in nearly every episode since his debut, except for episodes where Schulz was absent. However, on April 8, 2011, Dana Vachon was the first person to voice and operate Pinch other than Schulz, who was absent at the time. Pinch debuted on March 21, 2009 and was originally known as the New York Times Correspondent. After previous attempts by Gutfeld to call him "Timsey", on the March 26 show, the New York Times Correspondent said that "Pinch" would be an acceptable name because "you save a pinch when reading me." Pinch was often heard coughing excessively and, after July 15, 2009, Bill Schulz occasionally changed Pinch's healthy-looking cardboard eyes to sick-looking blood-shot cardboard eyes. As a reference to the national epidemic of newspapers slimming down by reducing content and cutting staff, Pinch was also drastically reduced over time to merely one thin section of newsprint. Pinch was introduced alongside the rest of the panel at the beginning of the show, usually speaking after Gutfeld prompted him with, "Good to see you again, Pinch", sometimes adding, "you piece of trash." Schulz then responded in character as Pinch with a rhyme; often, the rhyme was a satiric plug for a column or article that referenced a New York Times columnist or reporter by name. The March 12, 2011 episode marked the debut of "Porch", Pinch's intern. He was a miniature version of Pinch taken from a Bill Schulz bobblehead figure. Both Porch and Pinch have since been discontinued. Lloyd Webber: "Next thing [Cambridge will] have girls on Red Eye in the leg chair" (referring jokingly to herself). Gutfeld: "How dare you... you are obsessed with the leg chair." Lloyd Webber: "I am, yes." When Bill Schulz became exceptionally upset about a topic, he would often put on a pair of Buddy Holly–style large, black glasses known as the "outrage glasses". He would then speak in a farcical, hyper-angry voice. In a March 2011 Twitter post, Schulz claimed to have discovered the glasses behind a set of his father's vintage toy trucks in his house. Starting in May 2011, a split-second image with a short message has been infrequently flashed over close-up shots of Greg Gutfeld, Bill Schulz, Andy Levy, or sometimes over one of the guests during panel discussion. These semi-subliminal messages always involve either Gutfeld, Schulz or Levy wearing a silver-metallic mask with short messages printed underneath in large capital letters. 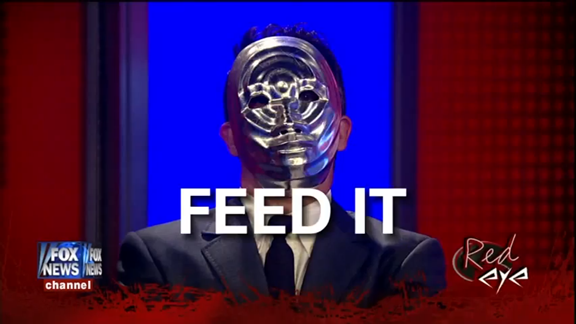 The short message under Greg Gutfeld's image has been "REDEEM HIM", "PUNISH HIM" (flashed March 6, 2011), "FEED IT" (flashed June 22, 2011), or "RETURN HIM" (flashed August 25, 2011). The short message under Bill Schulz's image was "AVOID HIM", "AVENGE HIM" (both flashed several times each during May 2011), or "RELISH HIM" (flashed July 8, 11). The message under Andy Levy's image has been either "SAVE HIM" (flashed late-May 2011) or "OBEY HIM" (flashed October 6, 2011). Andy Levy often mocks Gutfeld by saying, "I apologize for nothing." Gutfeld has responded to Levy's mocking statement with, "I apologize for everything." In a five-minute segment broadcast on Tuesday, March 17, 2009, Gutfeld and his panel discussed Canadian Lieutenant General Andrew Leslie's statement that the Canadian Armed Forces may require a one-year "synchronized break" once Canada's mission in Afghanistan ends in 2011. "Meaning, the Canadian military wants to take a breather to do some yoga, paint landscapes, run on the beach in gorgeous white Capri pants," Gutfeld said. "I didn't even know they were in the war", comedian panelist Doug Benson added, then continued, "I thought that's where you go if you don't want to fight. Go chill in Canada." Gutfeld also said: "Isn't this the perfect time to invade this ridiculous country? They have no army!" Schulz made comments about the Royal Canadian Mounted Police and their ceremonial red uniforms, and concluded by saying "This is not a smart culture!" Canadian Defence Minister Peter MacKay called on Fox to apologize for the satirical comments, describing the remarks as "despicable, hurtful and ignorant." Gutfeld, in response, maintained the show is satirical and irreverent but offered the following apology: "The March 17 episode of Red Eye included a segment discussing Canada's plan for a 'synchronized break,' which was in no way an attempt to make light of troop efforts. However, I realize that my words may have been misunderstood. It was not my intent to disrespect the brave men, women and families of the Canadian military, and for that I apologize." Doug Benson was scheduled to appear in Canada at Edmonton's The Comic Strip April 3–5, 2009, but the shows were canceled after the owner received threats of "bodily injury" toward the American comic. "Some were saying he wouldn't make it from the airport to the club. For everyone's safety, we decided it was best to avoid the scenario altogether," manager Rick Bronson said. Benson also offered an apology following the incident on CTV News. The comedian stated that he was "ignorant about the situation in Afghanistan" and that the timing of the jokes were "completely out of line". "I honestly said things, in retrospect, I completely regret" said Benson and has vowed to "never appear on the show again". Park51: located at the crossroads of "Sensibility" & "Sensitivity"
On August 10, 2010, Gutfeld proposed, on his blog, to construct the city's first Islamic-friendly gay bar next to the unfinished Park51 Islamic community center. As Gutfeld stated in his August 9, 2010 Greg-alogue, which was featured and discussed on Red Eye w/Greg Gutfeld: "As an American, I believe they have every right to build the mosque. Which is why, in the spirit of outreach...I'm announcing tonight, that I am planning to open the first gay bar that caters not only to the west, but also Islamic gay men. I hope the mosque owners will be as open to the bar, as I am to the new mosque. After all, the belief driving them to open their center near Ground Zero is no different than mine...understanding and tolerance." He also stated an entire floor will only serve non-alcoholic (virgin) drinks, in keeping with its Muslim-friendly atmosphere. Gutfeld later e-mailed and tweeted the developers at Cordoba House seeking a response to his idea. They tweeted back: "You're free to open whatever you like. If you won't consider the sensibilities of Muslims, you're not going to build dialog." After that tweet, Gutfeld announced he wanted to build and name his gay bar Dialogue. Other names for the proposed gay bar were sent into the Red Eye host (via Twitter and Internet) by fans, such as: al Gayda, Grind Zero, and Jihard. Gutfeld asked the developers to appear on his show to talk about the reason they rejected New York Gov. David Paterson's offer of New York State property farther from Ground Zero. Gutfeld noted the irony when they declined his invitation to talk by their reasoning he wouldn't engage in "dialogue". Gutfeld has stated he supports the constitutional right to build a mosque on that site; however, it is not a matter of freedom of religion but a question of sensitivity toward New Yorkers and Americans, who were the targets and victims on 9-11, that should be considered first and foremost. Gutfeld called his critics "the humorless left" and "ignorant cowards" who were afraid to "condemn real homophobia in the world". Gutfeld said: "Their accusations of Islamophobia are meant to hide their cowardice concerning gay rights" conflicting with Islamic teachings. "After all, Islam despises homosexuality—and this Muslim-friendly gay bar would help mend fences", Gutfeld said. Gutfeld insisted he was serious about building this gay-bar. He said he solicited some investors and received "countless inquiries regarding investments." Red Eye is featured on Louie in the episode titled "Come On, God," when Gutfeld hosts a debate between Louis C.K. and Ellen Farber. Ellen is the spokeswoman for an organization called Christians Against Masturbation, while Louie is the only person they could find to defend masturbation. Red Eye also appeared in three of Taiwan's Next Media Animations. The first was Is Islamophobia sweeping the US? which showed Gutfeld's gay bar next to the Park51 complex. The second video was Bedbugs Take Over USA. The final scene shows Gutfeld, Levy, and Schulz being attacked and eaten by giant bedbugs on the Red Eye set. The third video, Glenn Beck leaving Fox. Who will replace him?, proposed Red Eye as the best replacement for Glenn Beck because 5:00 p.m. is "when people are actually awake" while Gutfeld spars with a giant bedbug. Clips from Red Eye have been used on Russell Howard's Good News. Information about Red Eye's Nielsen ratings is sparse. In March 2007, when the show was still airing at 2:00 a.m. ET, Red Eye averaged 309,000 viewers in its time slot, down about 9 percent from March 2006 when another show aired in that same time slot. In the age 25–54 demographic, however, the show was up 15 percent from the prior year. In March 2006, the 2:00–3:00 a.m. time slot averaged 134,000 demo viewers; in March 2007, it was 154,000. In the 18–34 demo, the time slot was up 27 percent, from 33,000 to 42,000. After the show moved to its current 3:00 a.m. ET time slot in October 2007, Red Eye's ratings decreased. As of the show's one-year anniversary, average viewership dipped 15 percent, to 285,000. The 25–54 demo was down 24 percent, to 123,000. The show's second anniversary episode on February 5, 2009, however, showed significant improvement: Red Eye averaged 390,000 viewers, with 166,000 in the 25–54 demo. Nielsen also found that in March 2008, 6.1 percent of Red Eye's total viewership came from those who recorded the show, as opposed to watching it when it aired. In July 2009, Red Eye averaged 335,000 viewers, with 135,000 in the demo. In September 2009, Red Eye averaged 433,000 viewers, with 203,000 in the demo. In 2009, Red Eye was the 40th-highest rated cable news program, in terms of average total viewers. It averaged 365,000 viewers, with 163,000 in the demo. From February 1–5, 2010, the week of the show's third anniversary, Red Eye again averaged 433,000 viewers, with 180,000 in the demo. By its 1,000th show, Red Eye averaged 365,000 viewers, with 185,000 in the 25–54 demographic, up 17 percent over 2010 in total viewers and up 13 percent in the demo. In October 2011, the show averaged the largest audience in its history. In the key 25 to 54 age demographic, it beat CNN's Piers Morgan Tonight, Erin Burnett Outfront, John King, USA; MSNBC's Morning Joe and Hardball With Chris Matthews; and HLN's Nancy Grace. On August 17, 2013, Red Eye celebrated its 1,500th episode. That month, the show averaged 434,000 viewers, with 158,000 in the demo. Despite its 3:00 a.m. ET timeslot, it beat all but two of MSNBC's shows in the demo, and its overall viewership was just behind All In with Chris Hayes and Piers Morgan Live, which air on MSNBC at 8:00 p.m. and on CNN at 9:00 p.m., respectively. For the month of January 2014, Red Eye averaged 488,000 total viewers a night and 195,000 viewers in the key 25 to 54 viewing demographic. In February 2015, Red Eye averaged 339,000 total viewers, with 137,000 in the demo. ^ Red Eye: episode airing February 4, 2014. ^ Red Eye: episode airing February 28, 2015. ^ "Red Eye w/Greg Gutfeld". Fox News Channel. Archived from the original on April 17, 2011. Retrieved September 23, 2010. ^ "Red Eye w/Greg Gutfeld". TV Guide. Retrieved 2011-04-13. ^ Katerine Mangu-Ward (September 18, 2009). "Reason magazine "What You're Left With Is Libertarianism"". Reason. ^ "Fox News Channel Names Tom Shillue New 'Red Eye' Host". Adweek. ^ "Fox News Cancels Red Eye". www.adweek.com. Retrieved 2017-04-03. ^ "The Interrogation Room: Andy Levy". ning.com. Archived from the original on 2009-12-26. ^ "The Interrogation Room: Bill Schulz". ning.com. Archived from the original on 2013-01-20. ^ Robertson, Campbell (April 10, 2007). "At 2 A.M., Dark Humor Meets the Camera Lights". The New York Times. ^ Brian (February 1, 2007). "FNC Prepping Late Night "Red Eye" Talk Show, Hosted By Greg Gutfeld – TVNewser". Mediabistro.com. Retrieved 2011-04-13. ^ a b Rosenthal, Phil (February 28, 2007). "Satellite deal foes don't hear message". Chicago Tribune. Retrieved 2011-04-13. ^ a b "CHICAGO TRIBUNE CO. v. FOX NEWS NETWORK, LLC - Leagle.com". leagle.com. ^ "Court Ruling" (PDF). Retrieved October 18, 2011. ^ Phil Rosenthal Media February 18, 2007 (February 18, 2007). "Tribune Co. wants Fox `Red Eye' title closed". Chicago Tribune. Retrieved 2011-04-13. ^ "CHICAGO TRIBUNE CO. v. FOX NEWS NETWORK, LLC". leagle.com. ^ Phil Rosenthal Media (April 6, 2007). "The Times they are a-changin'?". Chicago Tribune. Retrieved 2011-04-13. ^ R. David Donoghue (April 11, 2007). "Redeye Preliminary Injunction Denied Despite Aurally Identical Marks: Chicago IP Litigation Blog". Chicagoiplitigation.com. Retrieved 2011-04-13. ^ "Court ruling" (PDF). chicagoiplitigation.com. Retrieved 2011-10-18. ^ "Toronto columnist Marsden ousted from Fox News". The Star. Toronto. May 31, 2007. ^ "Official Website". Rachel Marsden. Retrieved 2011-04-13. ^ "Joanne Nosuchinsky Leaves Fox News". ^ Crugnale, James (2011-12-16). "Red Eye's Greg Gutfeld Tells Mediaite About His CNN Guilty Pleasure…And So Much More". Mediaite. Retrieved 2011-12-16. ^ "worldnews Red Eye Ann Coulter Smacks Down Pinch". Wn.com. Retrieved 2011-04-13. ^ "Pally-Pals urban paper craft toys to download, print, cut, assemble & enjoy". Pallypal.com. Archived from the original on March 22, 2012. Retrieved October 18, 2011. ^ "3-2010 'Leg Chair' photo of Patti Ann Brown". Activitypit.ning.com. May 13, 2010. Archived from the original on January 19, 2016. Retrieved October 18, 2011. ^ "7-2010 'Leg Chair' photo of Lauren Sivan". Activitypit.ning.com. July 29, 2010. Archived from the original on January 19, 2016. Retrieved October 18, 2011. ^ "3-2011 'Leg Chair' photo of Imogen Lloyd Webber, a Cambridge alumni". Activitypit.ning.com. March 29, 2011. Archived from the original on October 12, 2011. Retrieved October 18, 2011. ^ "Welcome to Twitter - The people, topics and conversations you care about". twitter.com. ^ "GIF image of Red Eye showing semi-subliminal image of Gutfeld wearing silver-metallic mask w/message 'REDEEM HIM'". Archived from the original on July 28, 2013. Retrieved June 12, 2011. ^ "Photo of Greg Gutfeld wearing silver-metallic mask w/message 'RETURN HIM'". Archived from the original on 2012-07-07. ^ "Photo of Bill Schulz wearing silver-metallic mask w/message 'AVENGE HIM'". Archived from the original on July 11, 2012. Retrieved June 16, 2011. ^ "Photo of Andy Levy wearing silver-metallic mask w/message 'OBEY HIM'". Archived from the original on 2011-07-20. ^ "March 31, 2011 episode transcript of ''Red Eye w/Greg Gutfeld'', Time Ref: 00:00:54 Andy Levy quote, 'I apologize for nothing.'". Livedash.com. Archived from the original on October 9, 2011. Retrieved October 18, 2011. ^ Taylor, Jeremy. "Rolling Stone article w/Obama quote". Rolling Stone. ^ a b c "Obama Slams Fox News and 'Red Eye's' Greg Gutfeld Slams Him Back (VIDEO)". The Huffington Post. September 29, 2010 – via AOL. ^ Gutfeld, Greg (September 29, 2010). "Why Obama Needs Fox News". Archived from the original on October 7, 2010. Retrieved January 5, 2019. ^ a b c d "Fox host lampoons Canadian military's synchronized break during wartime". CBC News. March 23, 2009. Archived from the original on January 3, 2011. Retrieved October 18, 2011. ^ Fox News transcript of March 17, 2009 Red Eye w/Greg Gutfeld. ^ "Fox News mocks Canadian military – Canada". Cnews.canoe.ca. March 22, 2009. Archived from the original on July 12, 2012. Retrieved October 18, 2011. ^ "Fox News host apologizes for mocking Canadian military_English_Xinhua". News.xinhuanet.com. March 24, 2009. Archived from the original on November 7, 2012. Retrieved October 18, 2011. ^ a b "Fox host apologizes for mocking of Canadian Forces". CBC News. March 23, 2009. Retrieved 2016-08-05. ^ Greg Gutfeld (February 8, 2010). "Many quotes of Gutfeld, Schulz and Levy harshly lampooning each other during three years of "Red Eye"". Fox News Channel. Archived from the original on November 2, 2012. Retrieved October 18, 2011. ^ a b Shea, Danny (August 10, 2010). "Fox Newser: I'm Opening Gay Bar Next To Mosque". The Huffington Post. ^ Jordan Carr (August 10, 2010). "Fox News Host Proposes Muslim Gay Bar Next to Ground Zero Mosque". Aolnews.com. Archived from the original on October 4, 2012. Retrieved April 13, 2011. ^ "Greg Gutfeld Wants to Build Gay Bar Next to Ground Zero Mosque". Fox News Channel. August 11, 2010. ^ "The Left's Tired Response to Ground Zero Mosque". Fox News Channel. August 19, 2010. ^ a b c "The Daily Gut". ^ a b "'Glenn Beck': Greg Gutfeld Wants to Build Gay Bar Next to 'Ground Zero' Mosque". August 11, 2010. Archived from the original on February 1, 2011. Retrieved January 5, 2019. ^ a b "The Daily Gut". ^ "Clips of past Halftime Reports which shows hosts and panelists". Hulu.com. Archived from the original on October 18, 2011. Retrieved October 18, 2011. ^ "Mediabistro.com" (PDF). Archived from the original (PDF) on August 24, 2009. Retrieved April 13, 2011. ^ "Mediaite.com" (PDF). Retrieved 2011-04-13. ^ Shea, Danny (December 29, 2009). "Fox News 2009 ratings". Huffington Post. Retrieved 2011-04-13. ^ kevin (February 9, 2010). "Mediabistro.com". Mediabistro.com. Retrieved 2011-04-13. ^ "'Red Eye w/ Greg Gutfeld' hits 1,000 episodes (and way more Twitter fans)". Los Angeles Times. June 14, 2011. ^ Andreeva, Nellie (November 1, 2011). "CNN's 'Piers Morgan Tonight' Gets Beat In The Ratings By A 3 AM Fox News Show". Deadline Hollywood. Retrieved 2011-12-16. ^ "The Most Watched Cable News Programs in August Were…". mediabistro.com. ^ "Red Eye Ratings for January 2014". ning.com. Archived from the original on May 26, 2015. Retrieved February 6, 2014. ^ "Top Cable News Shows in February Were…". adweek.com. This page was last edited on 5 January 2019, at 20:33 (UTC).